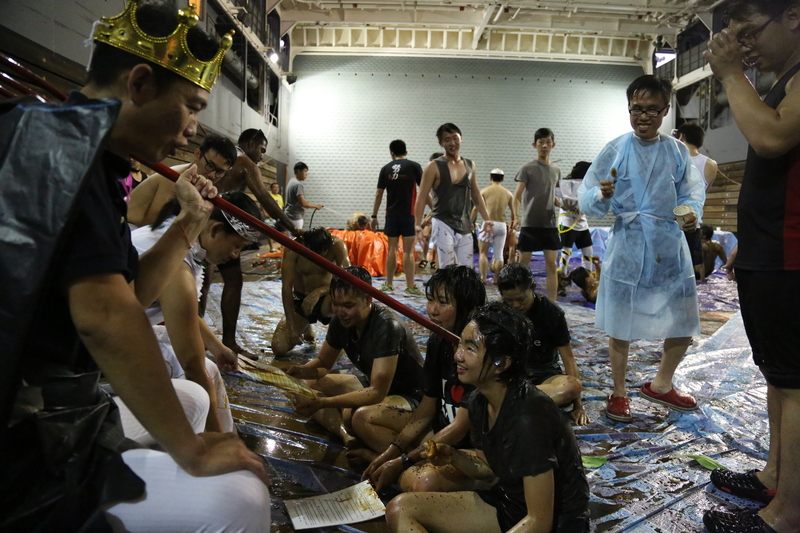 From slimy Pollywog to trusty Shellback – I get down and dirty in an equator crossing ceremony with the Republic of Singapore Navy. They haul us from our beds at five in the morning. It concludes the series of ominous pipes that have been playing through the night – Pollywogs, we are coming to get you! – is the common refrain amidst menacing cackles and throaty laughs. I am on board landing ship tank RSS Endeavour. It is the second leg on a six-week 74th Midshipman Sea Training Development/11th Military Domain Expert Course, and as the ship transits from Sulawesi to Singapore it will cross the equator. So will we. 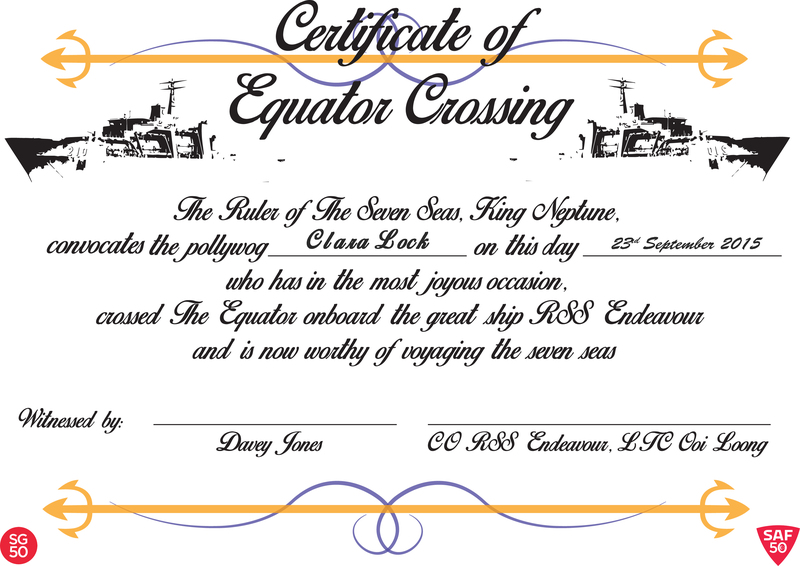 Crossing the equator is a maritime tradition, a hazing ritual that initiates new sailors, known as pollywogs, into the brethren. Google ‘equator crossing ceremony’ and there are a host of images from navies and merchant sailors around the world, mostly involving food and discomfort. Tonight we must complete a mini obstacle course that is meant to be as dirty, smelly and unpleasant as possible. Before the actual ceremony starts, we are soaked in the constant spray of a firehose on the tank deck of RSS Endeavour. When we are done we will be known as honourable shellbacks, worthy of the seven seas. It begins days before the actual ceremony, where shellbacks make eerie pipes through the ship’s public address system. When the lights are dimmed to red in the evenings they suit up in white robes and ghoulish masks to roam the various messes of the ship, and it feels a bit like halloween came early. I am easily spooked and hate horror movies, so this is not at all fun for me. We are not supposed to know when the actual ceremony will take place, but it’s hard to keep a secret on a navy ship. So when we go to bed on the night of 23 September, we have a pretty good idea of what’s coming. Just past ten pm, when the first pipe begins, I shriek and sit up in bed in fright, only to see my bemused cabin-mate staring up at my bunk from below. I sheepishly try to go back to sleep until the shellbacks come banging at my door at five in the morning. I tiptoe my way, barefoot, down to the tank deck and once I step through the watertight door, a hundred midshipmen are already crouched on the floor, bare bodied and shivering in the spray of a fire hose that douses us all in water. Various characters – Davy Jones and his pirates, the Royal Baby, King Neptune and his Queen – surround us, shouting and taunting. They alternate the spray of the fire hose with cups of ice water dumped on our heads. Needless to say it is freezing, and the midshipmen huddle together like penguins for warmth. One of the shellbacks hands out sausages, bread and steamed buns, although breakfast is the last thing on my mind. “Eat, or you’ll get hungry later,” midshipman and fellow pollywog Cassandra tells me. I am apprehensive, but many shellbacks agree that the ceremony used to be worse. Over the past few days they have been swapping stories of swill, rotten eggs and ox blood being used in the ceremonies they have gone through. The once piece of advice they share – the collective wisdom handed down through the years, is this: Wear clothes you can throw away later. But they all agree that crossing the equator is all in good fun, a shared experience that batch mates will laugh about – and grimace at – for a long time. These days, Pollywogs are luckier. I am told during the brief that all the food used in tonight’s ceremony will be fresh and edible – such as the dollop of baked beans that is poured onto the back of my neck while I am waiting for the obstacle course to start. When it does, we make our way on all fours down to the well dock – pollywogs must crawl, amid taunts from the shellbacks to keep your head down! An obstacle course has been set up between two fast crafts, and we slither on our bellies through a dark, sticky concoction. I make out the smell of coffee grinds and yong tau foo sweet sauce, while shellbacks douse us with flour and oil from above. Cracker crumbs, chilli sauce, vegetables and jam are some of the things I identify as I leopard crawl through a maze that is laced with a sticky concoction of food and sauces. A cacophony of voices reverberates around the enclosed well dock. Groups of midshipmen belt out the Navy song, while other groups count out sit-ups and push-ups they are being made to do. Shellbacks shout at us to crawl faster through the slippery mess, while using a mop to smear our heads and faces with unidentifiable concoctions. I reach a sea boat, which has been filled with a cold, grey, murky soup. It smells like tangerines and pepper, with vegetables floating on the surface. “Put your head in!” command the shellbacks around me. It looks disgusting, so I try to slither through without submerging my face. The shellbacks are not pleased. “Go again! Go again!” they holler. This repetition is par for the course during an equator crossing. Some of the midshipmen are made to crawl through the course up to eight times. Mounds of noodles lurk at the bottom of the grey, murky sea boat soup. I count myself lucky having to only do it twice more, before I make it to the last obstacle, King Neptune and Queen Amphitrite. Together with two other midshipmen we entreat the Royal Court to forgive our maritime misdemeanors, including polluting the seas, eating shark’s fin soup, and getting a little too happy with squid. King Neptune and his Queen hold court, and decide if the pollywogs can become shellbacks, or must go back for another round of the obstacle course. Then King Neptune raises his staff and anoints us. After two years and eight deployments in the Navy, this pollywog is now a proud shellback. And yes, I will laugh about it later. An abridged version of this article was published in the 3/15 issue of Navy News. All opinions expressed in the article are my own and do not necessarily reflect the official views of the Navy or Ministry of Defence.